Ages ago (well, it was Lottie and Lisa #20) Anni and I made a Lottie and Lisa when I saw her using a chinese newsletter on her card and I thought "I want that, too!!". Years later I got mail from China and they used newspaper for their packaging, so I kept that and knew I'd make a card out of this. Anni's challenge was perfect for this! - Of course I have NO idea about anything written there - hope it's nothing on the negative side - but I thought it would add some exotic feeling to this summery lemonade card. tear a piece of newspaper to the right size and attach it to your cardbase. Cut an oval panel (I used my Silhouette) and adhere it onto the paper with some foam pads. use alphabet stickers to create your own sentiment. adhering your rectangle-alpha-stickers in a wanky way has multiple advantages: you don't have to line anything up correctly AND it adds more dynamic to a fun card. 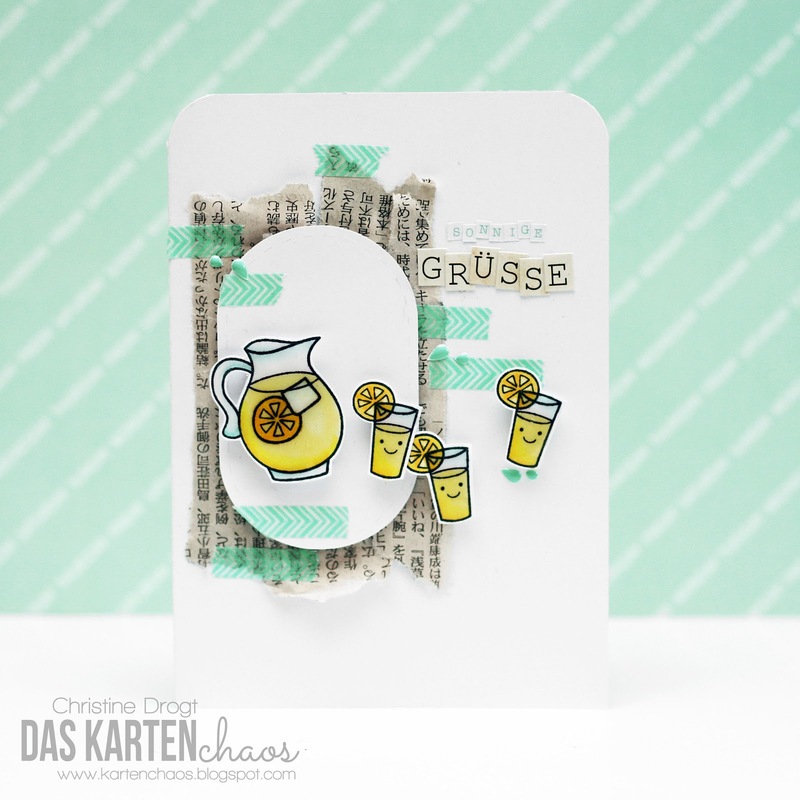 Glossy accents always add a little extra - and that glass-effect is perfect on stamp sets like this. wohaaaa.. die LIEBE ich!!!! Ich glaub ich hab mit dem Set noch nix gemacht obwohl ichs schon coloriert habe und echt toll finde.. menno.... und das originale Zeitungspapier ist genial.. hab mich auch sofort gefragt: "ist das n cooles patternd paper? oder wat?" This is ADORABLE!! I love that fun Chinese newspaper that you used. I also like the alpha stickers. I have so many that I should pull out to use on my cards. I forget what I have!! Beautiful design!! 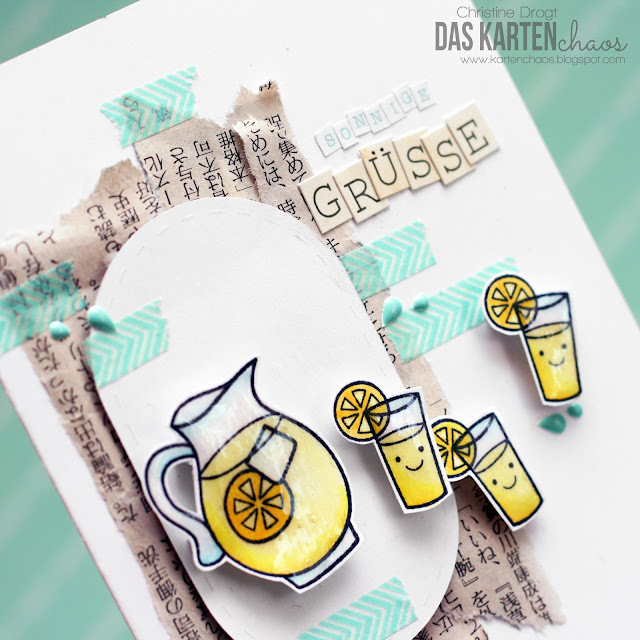 What a sweet, sweet lemonade stamp set. It looks so bright and summery with the washi tape. Thanks for joining the CCEE Stampers.